On this date in 1862, Confederate President Jefferson Davis proclaimed a national day of “Fasting, Humiliation and Prayer.” Aware of what was in store for his beloved country, Davis asked for the fast so that people could have the opportunity to reflect on the circumstances at hand. Ulysses S. Grant, a relatively unknown Union general, had won significant battles at Fort Henry on February 8 and Fort Donelson on February 18. This was a daunting situation for the South, because the loss of the two forts signified loss of control of the Tennessee and Cumberland Rivers, thus allowing the Yankees to attack the Confederacy’s interior. Nashville had been lost to Federal invasion on February 23, which was also alarming to the Confederacy. Davis’ proclamation for a day of prayer was significant for a time when this country was deeply rooted in Christian ideals and beliefs. Every event that occurred during the Civil War was attributed to God’s will. Davis had previously proclaimed a national day of fasting on June 13, 1861, and would request ten more during the course of the war, asking Southern citizens to attend church and fervently pray for the preservation of the South. 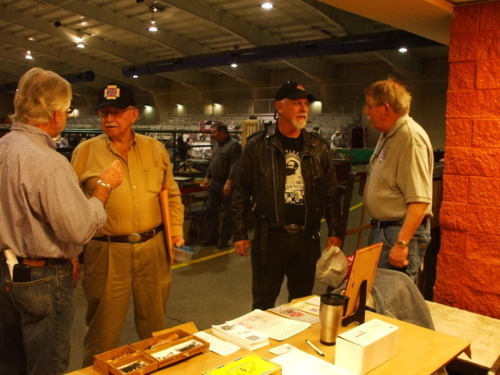 Last weekend, the Southaven, Mississippi Arena hosted its annual Civil War Gun Show. The event attracted several hundred people, as well as dozens of vendors. Many Civil War buffs came out to see displays of guns, artifacts, collectors items, and artwork, as well as old books and new authors selling their titles. 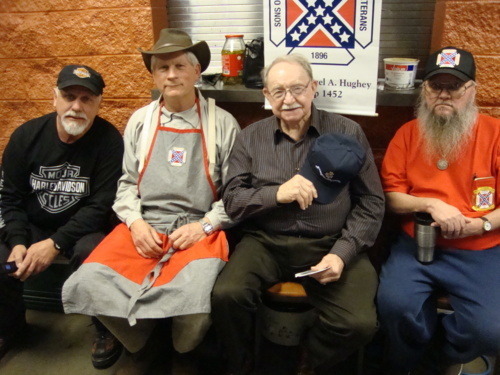 The local Sons of Confederate Veterans Samuel Hughey Camp was represented during the weekend. It was a great opportunity to see unique historical artifacts and meet Civil War enthusiasts. We even had a chance to vote for the re-instigation of Colonel Reb as mascot of Ole Miss! Timeless questions arise as to the reasoning behind such actions. During the War Between the States, many military maneuvers were still very new. Trench warfare orininated during the Civil War, as did the use of machine guns, hand granades, and land mines. Submarines were newly invented, as were iron ships. The Civil War was the first time that troops were transported by way of railroads. On this date in 1865, Union forces under General William Tecumseh Sherman continued their march of devastation, reaching Columbia, South Carolina. Because it was the first state to secede from the Union, soldiers felt a deep-seated vengeance, so they burned the city to the ground. The previous winter, they had gone through Alabama and on to Georgia, burning Atlanta and capturing Savannah before Christmas. The rampaging soldiers’ path spanned 60 miles wide. They burned, pillaged, and destroyed everything in their path. Their behavior was explained away by Sherman as waging “total war” against the enemy. Sherman was a serious racist, and although the Union supported emancipation, most soldiers didn’t. This was proven during the march, when Sherman ordered his men to destroy a bridge, leaving behind freed slaves who had followed them. The freedmen were so distraught over being left behind that many jumped into the river, and because they couldn’t swim, hundreds drowned. Sherman’s soldiers would continue north, tying up with General Ulysses S. Grant’s men as they laid siege on Petersburg. By early April, they would take the Confederate capital of Richmond as well, and force General Robert E. Lee to surrender his Army of Northern Virginia. This country’s 16th president, Abraham Lincoln, was born on February 12, 1809 in Kentucky. Oddly enough, his birthplace was only a few miles from that of the Confederacy’s first president, Jefferson Davis. When Lincoln was very young, his family moved to Indiana. His mother died when he was only 9, but not from a mysterious vampire monster. She actually succumbed to what was known as milk sickness. President Lincoln received much criticism during his presidency, especially and understandably from Southerners, but his untimely murder made many sad. It’s interesting to speculate whether Reconstruction would have gone more smoothly and wouldn’t have lasted as long if Lincoln had survived. Over the course of time, he has become a matyr for Emancipation, and has become almost a saint to most. His birthday is celebrated in conjunction every year with our first president and founding father, George Washington. Lincoln has been the subject of thousands of books, movies, articles, and other media outlets. Recently, Robert Redford’s The Conspirator was released, which told the story of Lincoln’s assassins, especially Mary Surratt. Two big movies are planned for release this year. Stephen Spielberg’s Lincoln will be released this fall, and Abraham Lincoln, Vampire Hunter will come out this summer. On this date in 1861, Jefferson Davis was chosen as the Confederacy’s new president. This was a momentous occasion for a country divided in controversy, seated on the edge of turmultous tragedy. Davis was reluctant to accept the job, since he deeply loved his country, but in the end, he accepted the position, which stipulated that his presidency would last for six years. Ironically, Davis, like so many public officials of his time, illuded to the horrors to come in his acceptance speech. He took his oath of office at the Capitol in Montgomery, Alabama. During the ceremony, the president arrived in a black lacquered coach drawn by six white horses, and to those watching, it probably seemed like a fairy tale, surreal in the respect that the South quite possibly could become its own nation. President Davis was sworn in to serve a six-year term of office, but of course, the Confederacy didn’t survive long enough for that vision to be realized. This event is discussed indepth in my new novel, A Beautiful Glittering Lie, which is due out this spring. The book will be available at all retail outlets and through Amazon. On this date in 1863, Secretary of State William Seward rejected France’s offer to mediate peace and end the War Between the States. Needless to say, because of his decision, millions more died, and some of the worst battles fought on American soil took place. Some of those battles still hold records today in the number of casualties they claimed. This brings us to that familiar old adage: What would have happened if the South had won the Civil War? There have been numerous books written on the subject, as well as ongoing blogs and discussions. One thing is for certain, however. If the war had ended at the onset of 1863, millions of American men would have kept their lives. Seward was criticized for his decision, and despised by some because of it. An accomplice of John Wilkes Booth, Lewis Powell, nearly killed Seward at the same time that Booth assassinated President Abraham Lincoln. After the war, Seward was criticized by the press for purchasing Alaska from Russia for $7.2 million, calling it “Seward’s Folly.” He got the last laugh though, when gold was discovered five years later, in 1872.